Mutations in the leucine-rich repeat kinase 2 (LRRK2) gene are the most common genetic cause of familial and sporadic Parkinson’s disease (PD). That the most prevalent mutation, G2019S, leads to increased kinase activity has led to a concerted effort to identify LRRK2 kinase inhibitors as a potential disease-modifying therapy for PD. An internal medicinal chemistry effort identified several potent and highly selective compounds with favorable drug-like properties. Here, we characterize the pharmacological properties of cis-2,6-dimethyl-4-(6-(5-(1-methylcyclopropoxy)-1H-indazol-3-yl)pyrimidin-4-yl)morpholine (MLi-2), a structurally novel, highly potent, and selective LRRK2 kinase inhibitor with central nervous system activity. MLi-2 exhibits exceptional potency in a purified LRRK2 kinase assay in vitro (IC50 = 0.76 nM), a cellular assay monitoring dephosphorylation of LRRK2 pSer935 LRRK2 (IC50 = 1.4 nM), and a radioligand competition binding assay (IC50 = 3.4 nM). MLi-2 has greater than 295-fold selectivity for over 300 kinases in addition to a diverse panel of receptors and ion channels. Acute oral and subchronic dosing in MLi-2 mice resulted in dose-dependent central and peripheral target inhibition over a 24-hour period as measured by dephosphorylation of pSer935 LRRK2. Treatment of MitoPark mice with MLi-2 was well tolerated over a 15-week period at brain and plasma exposures >100× the in vivo plasma IC50 for LRRK2 kinase inhibition as measured by pSer935 dephosphorylation. Morphologic changes in the lung, consistent with enlarged type II pneumocytes, were observed in MLi-2-treated MitoPark mice. These data demonstrate the suitability of MLi-2 as a compound to explore LRRK2 biology in cellular and animal models. Parkinson’s disease (PD) is a progressive neurodegenerative disorder characterized by resting tremor, slowness of movement, muscular rigidity, and postural instability. Postmortem PD brains reveal a distinctive loss of dopaminergic neurons in the substantia nigra along with insoluble α-synuclein-rich intracellular protein aggregates, termed Lewy bodies. Although motor symptoms of PD can be managed early in the disease with dopaminergic replacement therapies (e.g., levodopa, MAO inhibitors, and dopamine agonists), there are no therapies that can slow or stop disease progression. The failure to identify disease-modifying therapies stems largely from a lack of understanding of the pathologic mechanisms that culminate in clinical PD. In recent years, genomic advances have begun to shed light on the underlying pathologic mechanisms of PD, and although the vast majority of PD remains sporadic in origin, approximately 5–10% of cases can now be linked to a genetic origin. Mutations in the leucine-rich repeat kinase 2 (LRRK2) gene are the most common cause of monogenic PD and account for 4% of familial PD and 1% of sporadic PD (Healy et al., 2008). In contrast to other Mendelian forms of PD, LRRK2-PD appears clinically indistinguishable from idiopathic PD with regard to age of onset, presence of Lewy bodies, and responsivity to dopaminergic replacement (Healy et al., 2008). LRRK2 is a large multidomain soluble protein encompassing two core enzymatic functions comprised of a GTPase domain and a kinase domain. The enzymatic core is flanked by multiple protein-protein interacting domains, including armadillo, ankyrin, and leucine-rich repeat (LRR) structural motifs at the N-terminal, and the WD-40 domain at the C-terminal (Cookson, 2010). At least seven LRRK2 point mutations clearly segregate with familial PD (Paisan-Ruiz et al., 2004; Zimprich et al., 2004; Kachergus et al., 2005; Bonifati, 2007). The most common variant, G2019S, occurs within the LRRK2 kinase activation loop and results in increased kinase activity (West et al., 2005; Greggio et al., 2006). Preclinical observations of increased susceptibility to dopaminergic neurotoxins, mitochondrial dysfunction, and elevated α-synuclein in human LRRK2 mutant carrier–derived induced pluripotent stem cell (iPSC) models and G2019S knockin mice further confirm a toxic gain-of-function for kinase-activated mutations (Nguyen et al., 2011; Reinhardt et al., 2013; Sanders et al., 2014; Yue et al., 2015). Interestingly, GTPase domain variants R1441G, Y1699C, and N1437H also increase LRRK2 kinase activity (Sheng et al., 2012), suggesting the kinase domain is commonly and consistently dysregulated by many pathogenic LRRK2 mutations. The strength of the association of the LRRK2-G2019S mutation for causing PD, coupled with the phenotypic finding that the LRRK2-G2019S mutation results in increased kinase activity, collectively point to a pharmacologically tractable LRRK2 biology. Thus, the development of LRRK2 selective kinase inhibitors has been a dominant therapeutic focus for the treatment of PD. In the past five years, significant medicinal chemistry advances have been made in the development of potent and selective inhibitors of LRRK2 that are beginning to enable mechanism-of-action studies related to PD pathogenesis and assessments of LRRK2 pleiotropy beyond neurodegeneration. Initial studies reported a number of structurally diverse inhibitors of LRRK2 (Dzamko et al., 2010; Lee et al., 2010; Ramsden et al., 2011; Zhang et al., 2012) that were ultimately found to possess activities on a number of off-target kinases, thus limiting their utility for defining LRRK2 specificity of results. Subsequently, a number of potent inhibitors of LRRK2 kinase activity, with improved selectivity profiles, were disclosed, including LRRK2-IN-1 (Deng et al., 2011), GSK2578215A (Reith et al., 2012), and HG-10-102-01 (Choi et al., 2012). The utility of these molecules is, however, largely confined to in vitro assays owing to poor pharmacokinetic qualities and a lack of brain penetration. More recently, two novel LRRK2 kinase inhibitors (GNE-7915 and GNE-0877) were disclosed and used to probe the safety and tolerability profile of LRRK2 kinase inhibition in rodents and nonhuman primates (Estrada et al., 2012; Fuji et al., 2015). However, despite possessing improved biodistribution properties, both compounds inhibit several off-target kinases, and GNE-0877 has been associated with dose limiting toxicity in rats (Fuji et al., 2015). Despite these significant advances in developing LRRK2 kinase inhibitors over recent years, the field could greatly benefit from the generation of additional structurally diverse, potent, and selective LRRK2 kinase inhibitors that are more suitable for detailed exploration of LRRK2 biology in vivo as well as in vitro. In the present study, we report the discovery and pharmacology of cis-2,6-dimethyl-4-(6-(5-(1-methylcyclopropoxy)-1H-indazol-3-yl)pyrimidin-4-yl)morpholine (MLi-2; Fig. 1A), a potent, selective, and centrally active inhibitor of LRRK2 kinase activity that is suitable for exploring the therapeutic potential and safety of LRRK2 kinase inhibition. Structure and enzymatic activity of MLi-2. (A) Chemical Structure of cis-2,6-dimethyl-4-(6-(5-(1-methylcyclopropoxy)-1H-indazol-3-yl)pyrimidin-4-yl)morpholine (MLi-2). (B) GST-LRRK2 [G2019S] (1326–2527) was assayed using 400 nM LRRKtide in the presence of 134 μM ATP with the indicated concentrations of MLi-2. The results are presented as percentage inhibition of kinase activity. Results are averages of quadruplicate reactions. (C) Western blot and (D) quantification of the MLi-2 dose response for inhibition of pSer935 LRRK2 in Tet-inducible LRRK2 SHSY5Y cells. The results are presented as mean percent inhibition by MLi-2, calculated as the change from dimethylsulfoxide (DMSO) control samples. LRRK2 kinase activity was determined with LanthaScreen technology from Life Technologies (Grand Island, NY) using GST-tagged truncated human mutant G2019S LRRK2 (cat. no. PV4881) in the presence of the fluorescein-labeled peptide substrate LRRKtide (cat. no. PV4901). Assays were performed in the presence of 134 μM ATP (KmATP). Upon completion, the assay was stopped and phosphorylated substrate detected with a terbium (Tb)-labeled anti-phospho-ERM antibody (cat. no. PR8975A). The compound dose response was prepared by diluting a 10 mM stock of compound to a top concentration of 98 μM in 100% dimethylsulfoxide followed by serial dilution by 1:2.15 in dimethylsulfoxide nine times. Four hundred nanoliters of each dilution was spotted via a Labcyte Echo onto a 384-well black-sided plate followed by 10 μl of a 2.5 nM enzyme solution in 1× assay buffer (50 mM Tris pH 8.5, 10 mM MgCl2, 0.01% Brij-35, 1 mM EGTA, 2 mM dithiothreitol, 0.05 mM sodium orthovanadate). Following a 30-minute incubation at room temperature, the kinase reaction was started with the addition of 10 μl of 800 nM fluorescein-labeled LRRKtide peptide substrate and 186 μM ATP solution in 1× assay buffer. The reaction was allowed to progress at 25°C for 1 hour. The reaction was then stopped by the addition of 20 μl of TR-FRET Dilution Buffer (Invitrogen cat. no. PV3756B) containing 4 nM Tb-labeled anti-phospho LRRKtide antibody and 20 mM EDTA. After an incubation of 1 hour at room temperature, the plate was read on an EnVision multimode plate reader (Perkin Elmer, Waltham, MA) with an excitation wavelength of 340 nm and a reading emission at both 520 and 495 nm. Compound IC50s were interpolated from nonlinear regression best fits of the log of the final compound concentration, plotted as a function of the 520/495-nm emission ratio using GraphPad Prism. Stable Cell Line and Compound Treatments. A human neuroblastoma cell line, SH-SY5Y, was used for the LRRK2 stable cell line construction. SH-SY5Y cells were cultured in Dulbecco’s modified Eagle’s medium/F-12 supplemented with GlutaMax (Life Technologies), 10% tetracycline (Tet)-free fetal bovine serum (Clontech), nonessential amino acids (HyClone), pen-strep (100 μg/ml; HyClone) at 37°C and 5% carbon dioxide. Parental cells were transfected with plasmid constructs that overexpress full-length human LRRK2 wild-type or mutant (G2019S) under the control of a Tet-inducible promoter. Transfected cells were selected and maintained with hygromycin (2 μg/ml) and zeocin (100 μg/ml). Cells were seeded into six-well plates and induced with Tet (2 μg/ml) for 72 hours prior to treatment. After 90 minutes of compound incubation, cells were mechanically lifted, pelleted, and lysed with lysis buffer (MSD Lysis Buffer, cat. no. R60TX-3) supplemented with protease (Roche cOmplete Mini, cat. no. 11836170001), and phosphatase inhibitors (Halt Phosphatase Inhibitor, cat. no. 78420; Life Technologies). Pellets were further bead homogenized (1.5 minutes, frequency = 30, TissueLyser; Qiagen, Valencia, CA) and then spun at 13,200 rpm for 20 minutes at 4°C. Supernatants were then removed for subsequent Western blot analyses. SHSY-5Y cells heterologously stably expressing Tet-inducible human wild-type or G2019S LRRK2 were induced with tetracycline at 1 μg/ml for 48 hours and then plated in a suspension at 200K cells per well in 1× kinase assay buffer in a 96-well plate. Test compounds (10 serial 3-fold dilutions; top concentration 5 μM) were added to the cells in a total volume of 250 μl. Following a 30-minute incubation at room temperature, 250 μl of 0.7 nM [35S]MLi-A was added. Following a further 30-minute incubation at room temperature, reactions were terminated by rapid filtration on GF/B filterplates presoaked in 0.3% polyethylenimine using a Brandel Cell Harvester (Gaithersburg, MD). Filters were washed five times in ice-cold wash buffer (5.0 mM Tris, pH 7.5) then dried at 55°C for 45 minutes. Fifty microliters of Microscint 20 was added to each well, and plates were counted on a Packard TopCount. Ki values were determined from data points (the average of replicate determinations) using GraphPad Prism, by nonlinear regression–one site fit. Protein content per sample was determined by a bicinchoninic acid colorimetric assay, using bovine serum albumin as a standard (cat. no. 23225; Life Technologies). One-hundred micrograms of protein was reduced and denatured at 70°C for 10 minutes, then resolved on 3–8% Tris-acetate gels (cat. no. EA0378; Life Technologies) and transferred to polyvinylidene fluoride membranes (cat. no. LC2005; Life Technologies). Membranes were then blocked in 5% dry milk in Tris-buffered saline plus Tween-20 (cat. no. T9039; Sigma-Aldrich, St. Louis, MO) for 1 hour at 4°C and probed with rabbit anti-LRRK2-pSer935 LRRK2 (1 μg/ml, cat. no. AB133450; Abcam, Cambridge, MA) overnight at 4°C. Membranes were then incubated with donkey anti-rabbit conjugated to horseradish peroxidase (HRP) (1 μg/ml, cat. no. A16035; Life Technologies), combined with the IRDye 680CW (cat. no. 926-68076; LI-COR Biosciences, Lincoln, NE) for 30 minutes at 4°C. LRRK2-pSer935-HRP signals were subsequently developed by luminol-enhanced chemiluminescence (SuperSignal Substrate, cat. no. 34075; ThermoFisher Scientific, Sunnyvale, CA) and then visualized and analyzed on a LI-COR Odyssey system. For total LRRK2 detection, membranes were subsequently stripped (Restore PLUS, cat. no. 46430; Life Technologies), reblocked as above, and probed with rabbit anti-LRRK2 antibody (1:500 v/v, MJFF2 clone 41-2, cat. no. AB133474; Abcam) combined with mouse anti-GAPDH (cat. no. MAB374; Millipore) overnight at 4°C. Membranes were then incubated with donkey anti-rabbit conjugated to HRP (1 μg/ml, cat. no. A16035; Life Technologies), combined with the IRDye 800CW goat anti-mouse antibody (cat. no. 926-32210; LI-COR) for 30 minutes at 4°C. Horseradish peroxidase was then developed, visualized, and analyzed as above. For quantification, LRRK2-pSer935 signals were normalized to total LRRK2 and expressed as percentage of within-gel vehicle controls. Glyceraldehyde-3-phosphate dehydrogenase (GAPDH) levels were used for further normalization of protein loading for all samples to enable total LRRK2 quantification. Merck LRRK2 inhbitor-2 (MLi-2) was profiled for in vitro activity against 308 protein kinases using the Invitrogen SelectScreen protein kinase profiling service (http://www.thermofisher.com/us/en/home/products-and-services/services/custom-services/screening-and-profiling-services/selectscreen-profiling-service/selectscreen-kinase-profiling-service.html). All assays were performed at ATP concentrations near the Km (ATP). Compounds were tested at 10 μM, 1 μM, and 0.1 μM and the percent inhibition observed at the three concentrations were fitted to the four-parameter logistic equation in which maximum percent inhibition, minimum percent inhibition, and slope were held constant at 100, 0, and 1.0 respectively. Selectivity is reported as a percentage of kinases within 100× the LRRK2 IC50 in the LanthaScreen TR-FRET assay (ThermoFisher Scientific). The off-target profile of MLi-2 was further assessed across additional receptors, ion channels, and other proteins in a selectivity screen at a standard concentration of 10 μM (Eurofins Panlabs, Taipei, Taiwan). The full methods and references can be found at: www.eurofinspanlabs.com/Panlabs. The percentage of inhibition is given as the average of three determinations. When significant displacement of radioligand was observed (>50% inhibition at 10 μM), complete concentration-dependent displacement curves (in triplicate) were constructed to generate IC50 values. IC50 values were determined by a nonlinear, least-squares regression analysis using MathIQTM (ID Business Solutions Ltd., Guildford, Surrey, UK). All experiments were performed according to the policies of the Animal Care and Use Committee of Merck Research Laboratories, Kenilworth, NJ, in conjunction with the American Association for the Accreditation of Laboratory Animal Care approved guidelines and the Guide for Care and Use of Laboratory Animals (Institute of Laboratory Animal Resources, 1996). Unless otherwise stated, the studies involved male C57Bl/6 mice weighing 20–25g and were purchased from The Jackson Laboratory (Bar Harbor, ME). Upon arrival to the facility, mice were housed five animals per cage and maintained on a 12-hour light-dark cycle (lights on at 7:00 AM, lights off at 7:00 PM) under constant temperature (22 ± 2°C) and humidity (>45%) conditions. Standard laboratory diet (LabDiet 5001; LabDiet, St. Louis, MO) and water were available ad libitum. Mice were acclimated for at least 5 days before experimentation. Pharmacokinetic Properties of MLi-2 in Mice. The pharmacokinetic profile of MLi-2 was evaluated in male C57Bl/6 mice following a single intravenous (2 mg/kg; IV) or oral (10 mg/kg; PO) administration. Blood samples were collected at 5, 15, 30, 60, 120, 240, 360, and 480 minutes after dosing and plasma was prepared by centrifugation. Plasma levels of MLi-2 were determined by liquid chromatography and tandem mass spectrometry analyses (LC-MS/MS) on an API-5000 instrument (Applied Biosystems, Waltham, MA). The plasma and brain binding of MLi-2 was determined by equilibrium dialysis at 1 μM. Acute Effect of MLi-2 on Phosphorylation of LRRK2-Ser935 in Mouse Brain Cortex. Merck LRRK2 inhbitor-2 (MLi-2) was synthesized at Merck Research Laboratories. MLi-2 was suspended in 30% Captisol (Ligand Technologies, La Jolla, CA) and administered in a volume of 10 ml/kg. Dose calculations were on the basis of active moiety. Mice received MLi-2 [1-100 mg/kg; by mouth (PO)], or vehicle 1 hour prior to euthanasia by excess CO2. Immediately following euthanasia, mouse brain cortex was dissected and frozen on a steel plate over dry ice for analysis of pSer935 LRRK2 via Western Blot. Plasma and brain samples were collected and frozen as described above for determination of MLi-2 levels by LC-MS/MS. pSer935 LRRK2 data are expressed as the ratio of pSer935 LRRK2/total LRRK2 and expressed as mean ± S.E.M. The effect of MLi-2 on pSer935 LRRK2 levels in the brain and peripheral tissues were analyzed by one-way ANOVA and then post hoc comparisons were made by Dunnett’s test using Prism software (GraphPad Software, Inc.), and the level of significance was P < 0.05. Effect of 11-Days of In-Diet Treatment with MLi-2 (3–120 mg/kg per day) on Phosphorylation of Ser935 in Mice. Male C57Bl/6 mice (20–25g) from The Jackson Laboratory were singly housed in a room on a reversed 12-hour light-dark cycle (lights off at 9:00 AM and lights on at 9:00 PM) with rodent diet (Research Diets D01060501; Research Diets, New Brunswick, NJ) and water available ad libitum. Mice were allowed to acclimate to the reversed light cycle for one week before being placed on study. On day 1 of the study, mice were assigned to one of six treatment groups. Five groups of mice received rodent diet (Research Diets D01060501) containing MLi-2 and formulated by Research Diets targeted to provide concentrations of 3, 10, 30, 60, or 120 mg/kg per day on the basis of an average food intake of 3 g/day. The final group of mice received untreated diet (Research Diets D01060501) and served as the control group. Body weight and food intake were assessed daily (with the exception of the weekend). On day 10, 1 hour before the onset of the dark cycle, mice were transported to an adjacent room to assess the impact of MLi-2 on spontaneous locomotor activity (LMA). Spontaneous LMA was measured using a TruScan Photo Beam Activity System (Coulbourn Instruments, Whitehall, PA) that uses a three-plane tracking system with infrared sensors to record the animal’s movement. Mice were placed individually into the arena (26.67 × 26.67 × 39.37 cm) and distance traveled (cm) and rearing behavior was recorded for a period of 60 minutes. Mice were returned to their home cage immediately after LMA assessment. On day 11, mice were euthanized by excess CO2 at 4, 8, or 24 hours after the start of the dark cycle (n = 5 mice per treatment group). Immediately following euthanasia, mouse brain cortex and kidneys were dissected and frozen on a steel plate over dry ice for analysis of pSer935 LRRK2. Plasma and brain samples were collected and frozen for determination of MLi-2 levels. The effect of MLi-2 on pSer935 LRRK2 levels were analyzed by a two-way analysis of variance (ANOVA) and then posthoc comparisons made by Dunnett’s test. Locomotor activity data were analyzed by one-way ANOVA and then posthoc comparisons were made by Dunnett’s test. The level of significance was P < 0.05. Effect of 15 Weeks In-Diet Treatment with MLi-2 (30 mg/kg per day) in the MitoPark Mouse Model of PD. Male MitoPark (Ekstrand et al., 2007) and littermate wild-type mice arrived at the Merck testing facility at 4 weeks of age and were singly housed on a 12-hour light/dark cycle (lights on at 7:00 AM, lights off at 7:00 PM) with rodent diet (Research Diets D01060501) and water available ad libitum. Mice were acclimated to the facility for 4 days before undergoing a baseline LMA assessment for 60 minutes using the previously described method. At 5 weeks of age, which is prior to the onset of dopaminergic neuronal decline and the behavioral phenotype, the MitoPark mice were allocated to one of two treatment groups counterbalanced by initial baseline LMA (distance traveled). The first group received untreated rodent diet (Research Diets D01060501) and served as the control group (n = 30 per group). The second group received rodent diet containing MLi-2 targeted to provide 30 mg/kg per day (n = 30 per group). The dose of 30 mg/kg per day was selected on the basis of the previous in-diet dosing studies in C57Bl/6 mice and MitoPark mice, which demonstrated robust reductions (>90%) in cortical pSer935 LRRK2 at steady state. A third group of wild-type littermate mice received vehicle rodent diet (n = 30 per group). Body weight and food intake were recorded weekly and rodent diet containing MLi-2 was reformulated by Research Diets every 3 weeks to take into account changes in body weight and food consumption to continue to target 30 mg/kg per day. All three groups of mice underwent a 60 minutes LMA assessment at 8, 11, 14, and 17 weeks of age. Immediately after assessment of LMA at 8 and 14 weeks of age, 10 mice from each of the three treatment groups were taken to an adjacent room and euthanized by excess CO2. Mouse brain cortex was dissected and frozen on a steel plate over dry ice for analysis of pSer935 LRRK2. Additional brain tissue samples (cortex, striatum, and cerebellum) were dissected and frozen for neurochemical analysis and analysis of tyrosine hydroxylase levels (striatum only). Plasma and brain samples were collected for determination of MLi-2 levels. The final cohort of mice (n = 10 mice per treatment group) was euthanized by excess CO2 at 20 weeks of age. As in the previous necropsies, the brain was removed from all mice (n = 10 mice per group) and cortex dissected and frozen for analysis of pSer935 LRRK2 (n = 10 per treatment group). An additional set of peripheral tissues, including lung, kidney, and spleen was collected from five mice per treatment group for analysis of peripheral pSer935 LRRK2. Plasma and brain samples were collected from the same five mice for MLi-2 levels. The remaining five mice per group underwent a safety assessment. Kidney, lung, and brain were fixed in 10% neutral buffered formalin. Tissues were paraffin-embedded and sectioned at 5 μM followed by staining with hematoxylin and eosin and microscopic examination. The effect of MLi-2 on pSer935 LRRK2 levels in the brain and peripheral tissues were analyzed by one-way ANOVA, and then posthoc comparisons were made by Tukey’s multiple comparison test. Body weight, food intake, and LMA data were analyzed by a two-way ANOVA, and then posthoc comparisons made by Tukey’s multiple comparison test. The level of significance was P < 0.05. Determination of Striatal Dopamine, DOPAC, and HVA Levels. Tissue samples were weighed individually and stored at –80°C in plastic tubes until analyzed for dopamine and metabolite levels. Immediately before analysis, samples were thawed on ice, and perchloric acid (0.1 M) was added to the sample tube to achieve 0.1 g/ml according to tissue weight. Samples were homogenized on ice using ultra sonication. Samples were then vortexed and stored at 4°C for 60 minutes. The samples were next centrifuged for 5 minutes at 12,000 rpm, and the dopamine and metabolite content of the supernatant was analyzed by high-performance liquid chromatography with electrochemical detection. An MD-150-150 column (3 × 150 mm, 3 μm; ESA Bioscience, Chelmsford, MA) was used, and the mobile phase was MD-TM purchased from ESA Bioscience. The flow rate for the analytical column was 0.25 ml/min, which was maintained at 40°C with a column heater. A Coulochem III with Guard Cell 5020 (+350mV) and Analytical Cell 5014 (E1 –150mV, E2 +220mV) was used to detect dopamine and metabolites. Tissue concentrations of dopamine and metabolites were determined by comparing the ratio of peak areas for unknowns versus an internal standard (3,4 dihydroxybenzoic acid) to standard curves generated from known amounts of analytes of interest (using ratio of standard peak areas verse internal standard). Linear regression curves were plotted for dopamine (DA) and major metabolites (DOPAC, HVA). Absolute tissue concentration of dopamine and metabolites are calculated on the basis of the linear regression curve. DA, HVA, and DOPAC levels were analyzed by one-way ANOVA, and then posthoc comparisons were made by Tukey’s multiple comparison test. The level of significance was P < 0.05. Striatal tissue was bead homogenized and lysed in 300 μl MSD Lysis Buffer (R60TX-3) with protease (cOmplete Mini, cat. no. 11836170001; Roche) and phosphatase inhibitors (Halt Phosphatase Inhibitor, cat. no. 78420; Life Technologies). Protein content per sample was determined by a bicinchoninic acid colorimetric assay, as described above. Twenty micrograms of striatal protein was reduced and denatured at 70°C for 10 minutes, then run on NuPAGE 3–8% Tris-acetate gels (Life Technologies, EA0378) and transferred to polyvinylidene fluoride membranes (cat. no. LC2005, Life Technologies). Membranes were blocked in 5% dry milk in Tris-buffered saline plus Tween-20 for 1 hour and probed with mouse anti-Tyrosine Hydroxylase (1μg/ml, cat. no. MAB5280; Millipore) and mouse anti-GAPDH (cat. no. MAB374; Millipore) overnight at 4°C. Membranes were then incubated with goat anti-mouse-HRP (cat. no. sc2005; Santa Cruz Biotechnology, Dallas, TX) for 1 hour at room temperature. HRP signals were subsequently developed by chemiluminescence (SuperSignal substrate, cat. no. 34075; Thermo Fisher Scientific) and were then visualized and analyzed on a LI-COR Odyssey system. Tyrosine hydroxylase levels were analyzed by one-way ANOVA and then post hoc comparisons were made by Tukey’s multiple comparison test. The level of significance was P < 0.05. In Vitro Potency of MLi-2 and Selectivity Profile of MLi-2. MLi-2 (Fig. 1A) was discovered as part of a small-molecule discovery program aimed at the identification of potent and selective LRRK2 inhibitors. The discovery and evolution of the indazole series of LRRK2 inhibitors from which MLi-2 emerged will be described in detail elsewhere (Miller et al., in preparation). MLi-2 exhibits potent inhibition of purified G2019S LRRK2 kinase with an IC50 of 0.76 nM (Fig. 1B). MLi-2 had an IC50 < 1 μM for five kinases tested other than LRRK2: CLK4, 225 nM; MAP3K14, 244 nM; MAP3K5, 428 nM; CLK2, 605 nM; and TTK, 935 nM. One-hundred percent of kinases tested for MLi-2 had an IC50 greater than 100 times the LRRK2 IC50 (0.76 nM). Further off-target profiling revealed that MLi-2 inhibited five nonkinases with IC50s < 10 μM: serotonin 5-HT2B, 1.2 μM; norepinephrine transporter, 3.8 μM; muscarinic M2, 6.4 μM; peroxisome proliferator-activated receptors γ, 6.5 μM; and adenosine transporter, 9.7 μM. Cellular Potency of MLi-2 by Ser935 LRRK2 Dephosphorylation. The phosphorylation-status of LRRK2 amino acid Ser935 was assessed as an indicator of LRRK2 kinase inhibition. Although this site is not directly phosphorylated by LRRK2, agreement in rank-order potencies was maintained between biochemical and cellular Ser935 IC50s across various MLi-2 analogs (see Supplemental Table 2), demonstrating the value of evaluating Ser935 dephosphorylation to confirm cellular LRRK2 kinase inhibition. In Tet-inducible LRRK2 SH-SY5Y cells, MLi-2 exhibited a pSer935 LRRK2 IC50 of 1.4 nM (Fig. 1, C and D), in line with its high potency in the biochemical assay (LanthaScreen Assay, IC50 0.76 nM) and indicative of MLi-2 possessing high cellular permeability. A key issue with the use of pSer935 LRRK2 dephosphorylation as a measure of cellular potency and a surrogate for in vivo target engagement is that this is not a direct LRRK2 autophosphorylation site. This raises the possibility that this readout may not directly correlate with enzyme occupancy by LRRK2 inhibitors. To investigate this we developed a whole-cell binding assay using a novel LRRK2 inhibitor radioligand, [35S]MLi-A, in Tet-inducible LRRK2 SH-SY5Y cells (Fig. 2A). [35S]MLi-A exhibited high levels of displaceable and saturable high-affinity binding (Kd = 0.2 nM) with negligible nondisplaceable binding in the absence of Tet-induction (Fig. 2B). Comparable binding was observed using cells expressing G2019S LRRK2 (Kd = 0.52 nM; Supplemental Fig. 1). Whole-cell competition binding studies were subsequently performed with multiple LRRK2 inhibitors. In this assay, MLi-2 exhibited a Ki of 3.4 nM, very close to its cellular IC50 (1.4 nM) in the pSer935 LRRK2 dephosphorylation assay (Fig. 2C). Indeed, IC50 values generated in the whole-cell LRRK2 binding assay were found to be in line with values obtained from the cellular pSer935 LRRK2 dephosphorylation assay with a variety of inhibitors (see Supplemental Table 1). These data therefore led us to conclude that pSer935 LRRK2 dephosphorylation assay closely approximates target occupancy, as defined in cell lines expressing LRRK2 and, therefore, presumably in vivo as well. Whole-cell LRRK2 radioligand binding. (A) Chemical structure of LRRK2 radioligand ([35S]MLi-A). (B) Whole-cell saturation binding with increasing concentrations of [35S]MLi-A in Tet-inducible wild-type LRRK2 expressing SHSY5Y cells. Binding was performed in the absence of induction (noninduced) or where expression was induced for 48 hours in the presence of tetracycline (Tet-induced). The results are presented as specific binding and are averages of triplicate reactions. The KD value, in nM, is derived from the graph. (C) Displacement of [35S]MLi-A binding with MLi-2. Experiments were performed with 0.7 nM [35S]MLi-A and increasing concentrations of MLi-2. The results are presented as specific binding and are averages of triplicate reactions. The Ki value, in nM, is derived from the graph. CPM, counts per minute. Pharmacokinetic Profile of MLi-2 in Mice. Pharmacokinetic and oral bioavailability data for MLi-2 in mice are summarized in Table 1. In mice, the mean maximum plasma concentrations following a single 10-mg/kg oral dose occurred at 0.75 hours postdose. The mean residence time (MRT) was 2.7 hours following intravenous dosing, and ∼11 hours following oral dosing, indicating a relatively long mean absorption time. Oral bioavailability for MLi-2 in mice was ∼45%. Unbound fraction in plasma and brain was determined to be 0.008 and 0.009, respectively. Effect of MLi-2 on Phosphorylation of Ser935 in Mouse Brain Cortex. On the basis of the pharmacokinetic profile of MLi-2, we evaluated the ability of MLi-2 to inhibit phosphorylation of LRRK2 Ser935 in the brain of wild-type mice after acute oral dosing. As shown in Fig. 3, A–C, 1 hour after oral administration unbound brain concentrations of MLi-2 increased in a dose-dependent fashion (up to 273 nM at 100 mg/kg) whereas phosphorylation of Ser935 [F(5,29) = 13.44; P < 0.001] decreased in a dose-dependent manner (P < 0.05, P < 0.001) with maximal suppression (>90% reduction) of pSer935 LRRK2 achieved at 10 mg/kg and higher. Effect of oral administration of various doses of MLi-2 on pSer935 LRRK2 in the brains of mice after acute, single administration. (A) Western blot and (B) quantification of LRRK2 pSer935 LRRK2 levels. (C) Unbound brain concentration of MLi-2. Data are mean ± S.E.M. ; n = 5 mice per treatment group. *P < 0.05–P < 0.001 compared with the vehicle-treated animals. Effect of 11 Days In-Diet Dosing with MLi-2 (3–120 mg/kg per day) on Phosphorylation of Ser935 in Mouse Cortex and Kidney. To determine if MLi-2 might be a suitable compound to explore the chronic effects of LRRK2 kinase inhibition (e.g., excellent in vivo oral potency and well tolerated), we evaluated the effect MLi-2 on the phosphorylation status of Ser935 in mouse cortex and kidney after in-diet delivery for 11 days. In-diet administration of MLi-2 was well tolerated and there were no differences in body weight in the MLi-2-treated groups compared with the mice receiving vehicle over the 11-day treatment period (data not shown). Food intake in all MLi-2-treated groups tended to be lower than in the vehicle-treated group during the first 1–3 days of the study but returned to normal feeding levels thereafter. As a result, the targeted doses of MLi-2 on a mg/kg per day basis was achieved in all animals. Figure 4, A and B, shows the effect of 11 days of in-diet administration of MLi-2 (3-120 mg/kg per day) on pSer935 LRRK2 levels in the cortex of mice. A two-way ANOVA revealed a significant effect of drug [F(5,24) = 12.0; P < 0.001], time [F(2,48) = 7.34; P < 0.001] and drug x time interaction [F(10,48) = 3.4; P < 0.001]. Post-hoc analysis revealed that MLi-2 administration resulted in a dose-dependent inhibition of Ser935 in the brain that was sustained across the 24-hour sampling period. The reduction in pSer935 LRRK2 was statistically significant compared with the vehicle-treated group at all doses at the 4-hour time point (P < 0.001) and at 10, 30, 60, and 120 mg/kg per day at 8- and 24-hour time points (P < 0.001). Across all time points a maximal reduction in pSer935 LRRK2 was observed at 30 mg/kg per day. Similar reductions in pSer935 LRRK2 were observed in the kidney after 11 days in diet dosing with MLi-2 (Supplemental Fig. 2, A and B); drug [F(5,24) = 262.9; P < 0.001], time [F(2,48) = 11.1; P < 0.001] and drug x time interaction [F(10,48) = 3.67; P < 0.001]. Posthoc analysis revealed statistically significant reduction in pSer935 LRRK2 compared with the group receiving vehicle diet at all doses and time points (P < 0.001). As shown in Fig. 4C, there was no effect of MLi-2 on total LRRK2 protein levels in the brain after 11 days of in-diet dosing [drug: F(5,24) = 0.8; n.s.]. However, a significant reduction in LRRK2 protein levels, detected by Western blot using MJFF-2 antibody, was observed in the kidneys of mice treated with MLi-2 for 11 days (see Supplemental Fig. 2, A and B); drug [F(5,24) = 41.1; P < 0.001], time [F(2,48) = 141.2; P < 0.001], and drug × time interaction [F(10,48) = 3.5; P < 0.001]. The effect of total LRRK2 protein levels in the kidney was dependent on dose and was statistically significant compared with the vehicle-treated animals at all doses at the 4-hour time point (P < 0.001 in all cases); at 10, 30, 60, and 120 mg/kg per day at the 8-hour point (P < 0.001 in all cases); and at 30, 60, and 120 mg/kg per day doses at the 24-hour point (P < 0.001 in all cases). Analysis of the unbound pharmacokinetic data shown in Fig. 4D revealed that in-diet dosing with MLi-2 resulted in dose-dependent increases in MLi-2 exposures in the brain. Similar MLi-2 unbound exposures were observed in the plasma (data not shown). Moreover, the in-diet dosing approach led to consistent MLi-2 exposure in brain and plasma over the 24-hour sampling period with minimal peak-to-trough variation, which is in excellent agreement with the sustained pharmacodynamic effect of MLi-2 on pSer935 LRRK2 in the brain and periphery. Using a pharmacodynamic Emax model, we determined the brain pSer935 LRRK2 IC50 for MLi-2 to be 0.8 nM using unbound brain exposure (see Fig. 4E) and 1.1 nM (data not shown) using unbound plasma exposure. As Parkinson’s disease is primarily a motor disorder and the evaluation of pharmacological treatments in animal models of PD relies heavily on locomotor activity endpoints, we also evaluated the effect of MLi-2 on spontaneous LMA to control for possible interference in subsequent locomotor assessments. Eleven days of in-diet dosing with MLi-2 did not impact spontaneous locomotor activity as measured by distance traveled [F (5, 24) = 1.26; P = 0.31] or rearing behavior [F (5, 24) = 0.35; P = 0.87] in mice at any of the doses examined (Supplemental Fig. 3, A and B). Effect of MLi-2 (3–120 mg/kg per day) on pSer935 LRRK2 (ratio of pSer935/total LRRK2) and total LRRK2 (total LRRK2/GAPDH) in the brains of mice after 11 days of in-diet dosing. (A) Western blot showing pSer935 LRRK2 and total LRRK2. (B) and (C) shows the quantification of pSer935 LRRK2 and total LRRK2, respectively. (D) Unbound brain concentrations of MLi-2 on day 11 in mice administered MLi-2 in diet for 11 days. Open circles, 3 mg/kg per day; 10 mg/kg per day, open squares; 30 mg/kg per day, closed triangles; 60 mg/kg per day, open triangles; and 100 mg/kg, closed circles. (E) pSer935 LRRK2 levels (ratio of pSer935/total LRRK2 expressed as a percentage of the vehicle control group) in the brains of mice versus unbound brain concentrations of MLi-2 (3–120 mg/kg per day) on day 11 of in-diet dosing. Mice were euthanized a 4, 8, and 24 hours after the start of the dark cycle on day 11 of dosing. Data are mean ± S.E.M. ; n = 5 per treatment group; ***P < 0.001 compared with the vehicle diet–treated animals. Effect of 15 Weeks In-Diet Treatment with MLi-2 (30 mg/kg per day) on Phosphorylation of Ser935, Behavior, and Neurochemistry in the MitoPark Mouse Model of PD. The connection between LRRK2 and mitochondrial function (Biskup et al., 2006; Saha et al., 2009) suggested that LRRK2 kinase inhibition may confer neuroprotective effects in PD models of mitochondrial dysfunction. To evaluate the disease-modifying potential of LRRK2 kinase inhibition we therefore evaluated the effect of MLi-2 in the MitoPark mouse model of PD; a model in which a PD-like phenotype develops as a result of DAT-Cre-dependent knockout of the mitochondrial transcription factor (TFAM). Asymptomatic, 5-week-old MitoPark mice were treated for up to 15 weeks with MLi-2 in diet at a dose of 30 mg/kg per day At this concentration, MLi-2 has been shown to inhibit pSer935 LRRK2 by greater than 90% over a 24-hour period in both wild-type (see Fig. 4, A and B) and MitoPark mice (data not shown). Consistent with short-term in-diet administration, chronic treatment with MLi-2 (30 mg/kg per day) was well tolerated. All groups gained weight throughout the study and no differences in body weight were observed between MLi-2-treated mice and the vehicle-treated MitoPark mice (Fig. 5A). There were also no differences in terms of food intake between the MLi-2-treated mice and the vehicle-treated MitoPark mice (Fig. 5B), and the targeted 30 mg/kg per day dose of MLi-2 was achieved (Fig. 5C). Analysis of MLi-2 levels in the plasma and brain revealed that the unbound brain exposure of MLi-2 was in excess of the in vivo brain pSer935 LRRK2 IC50 (0.8 nM unbound brain; 1.1 nM unbound plasma) or unbound brain throughout the study (unbound plasma week 8, 5.51 ± 1.38 nM; week 14, 8.48 ± 2.29 nM; week 20, 7.64 ± 2.74 nM and unbound brain week 8, 5.04 ± 1.09 nM; week 14, 6.48 ± 1.49 nM, and week 20, 7.36 ± 2.3 nM). In agreement with the pharmacokinetic data, analysis of the pharmacodynamic response (Fig. 5, D–I) revealed that MLi-2 markedly inhibited pSer935 LRRK2 in the brain at all of the time points measured compared with the vehicle-treated MitoPark mice. Total LRRK2 protein levels, measured by Western blot using MJFF-2 antibody in the brains of MLi-2-treated MitoPark mice were not different from vehicle-treated MitoPark mice at any time point (data not shown). Despite demonstrating significant pharmacodynamic effect, as measured by inhibition of pSer935 LRRK2, MLi-2 did not stop the progressive motor phenotype that is observed in MitoPark mice. Locomotor activity and rearing behavior were comparable across the three groups at baseline and at 8 weeks of age (3 weeks on treatment). It should be noted, however, that at baseline the MitoPark mice that were subsequently placed on MLi-2 displayed higher rearing behavior than the wild-type cohort at baseline; P < 0.05). Activity levels in both the vehicle (P < 0.001 in all cases) and MLi-2-treated MitoPark mice (P < 0.001 in all cases) declined significantly by week 11 (6 weeks on treatment) compared with the wild-type littermate control groups (Fig. 6, A and B). 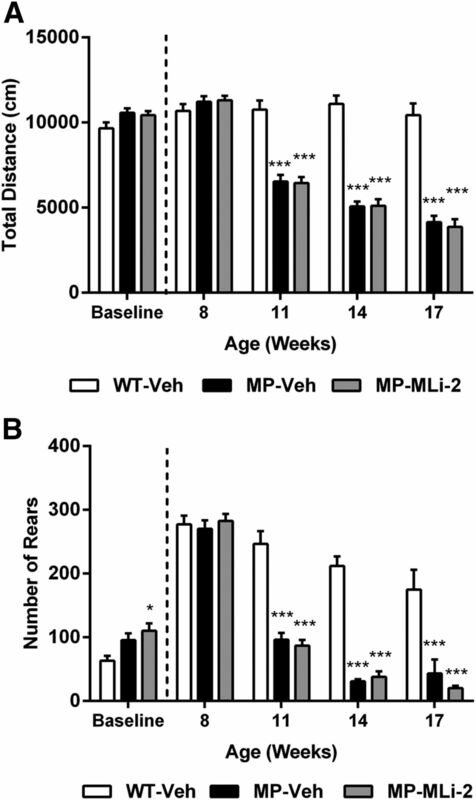 This decline in locomotor and rearing behavior continued throughout the study and at no time point did the MitoPark mice-treated with MLi-2 statistically differentiate from the vehicle-treated MitoPark group on either behavioral measure. In agreement with the lack of efficacy of MLi-2 on the behavioral endpoints, neurochemical analysis also revealed that MLi-2 treatment failed to prevent the decline in striatal dopamine, DOPAC, or tyrosine hydroxylase levels that were evident in MitoPark mice at 8 weeks of age (3 weeks on treatment; P < 0.05 in all cases compared with the wild-type-vehicle-treated group) and prior to the onset of the behavioral deficit at week 11 (see Table 2). Chronic in-diet dosing with MLi-2 (30 mg/kg per day) is well tolerated and leads to sustained inhibition of CNS LRRK2 kinase activity. (A) Bodyweight, (B) food intake, and (C) dose achieved per week of the study. Effect of MLi-2 at 30 mg/kg per day on pSer935 LRRK2 levels in the cortex of mice after (D) 3 weeks on treatment, (F) 9 weeks on treatment, and (H) 15 weeks on treatment. Panels (E), (G), and (I) show the Western blot data for pSer935 LRRK2, total LRRK2, and GAPDH from each time point. MLi-2 treatment started at 5 weeks of age. N = 10 mice/group per time point. Data are mean ± S.E.M. ; n = 10 per treatment group; *P < 0.001 compared with the vehicle diet–treated animals. Chronic in-diet dosing with MLi-2 (30 mg/kg per day) does not attenuate the behavioral phenotype in in MitoPark mice. Effect of MLi-2 on (A) distance traveled (B) rearing measured for 60 minutes. MLi-2 treatment started at 5 weeks of age. Data are mean ± S.E.M. ; n = 10 per treatment group. *P < 0.05; ***P < 0.001 compared with the vehicle diet–treated animals. In addition to evaluating the disease-modifying potential of LRRK2 kinase inhibitors in the MitoPark mouse model, we took advantage of the extended duration of this study to also explore the long-term tolerability of LRRK2 kinase inhibition. In particular, histologic and morphologic assessments were made of kidney and lungs that were demonstrated to have been altered in LRRK2 knockout (KO) mice. As shown in Fig. 7, A, B, and D, MLi-2 markedly inhibited lung and kidney pSer935 LRRK2 levels at this time point. 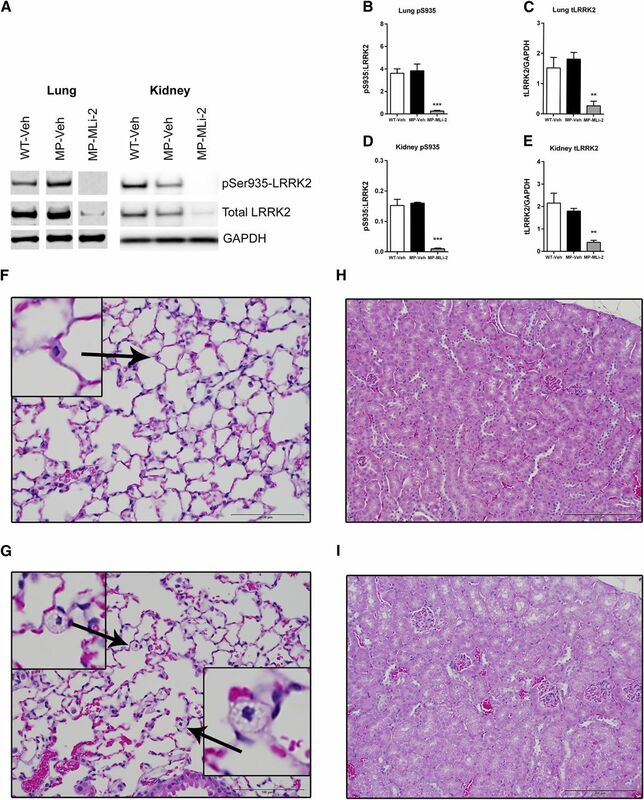 Significant reductions in LRRK2 total protein levels also were observed at 20 weeks of age in both the lung and kidney of MLi-2-treated mice (Fig. 7, C and E). Unlike observations of kidney darkening in LRRK2 KO mice (Herzig et al., 2011; Baptista et al., 2013; Tong et al., 2012), MitoPark mice receiving rodent diet containing MLi-2 at 30 mg/kg per day for 15 weeks did not exhibit kidney darkening upon gross examination nor accumulation of pigment in renal cortical tubules on tissue section. MLi-2 treatment at 30 mg/kg per day for 15 weeks was associated with very slight enlargement of randomly scattered alveolar epithelial cells that had features consistent with type II pneumocytes. The enlargement consisted of increased prominence of the type II pneumocytes owing to variable degrees of distension of the cytoplasm by numerous clear, round vacuoles, which were larger and more numerous than those observed in type II pneumocytes of untreated control mice. The number of affected cells varied greatly per 400×-field, from very few in some fields to several affected type II pneumocytes in other fields. This finding was observed in five out of five of the MLi-2-treated animals examined. No findings of enlarged type II pneumocytes were observed in wild-type or MitoPark mice receiving vehicle diet for the same duration. Effect of chronic in-diet dosing with MLi-2 (30 mg/kg per day) on LRRK2 kinase activity and histology in lung and kidney of MitoPark mice. (A) Representative Western blot data for the effect of MLi-2 on pSer935 LRRK2 and total LRRK2 in the lung and kidney of MitoPark mice. Quantification is shown in (B) for lung pSer935, in (C) for lung total LRRK2, in (D) for kidney pSer935, and in (E) for kidney total LRRK2. Mice were euthanized at 20 weeks of age, 15 weeks after treatment started. Lung histology images from vehicle- (F) and MLi-2- (G) treated MitoPark mice. MLi-2 treatment at 30 mg/kg per day for 15 weeks was associated with very slight enlargement of randomly scattered alveolar epithelial cells that had features consistent with type II pneumocytes. Kidney histology images from vehicle- (H) and MLi-2- (I) treated MitoPark mice. No accumulation of pigment in renal cortical tubules was observed in the vehicle- (H) or MLi-2- (I) treated MitoPark mice. Histology of the lung and kidney was performed at 20 weeks of age, 15 weeks after treatment started, and on n = 5 mice per treatment group. Representative images for the vehicle-treated wild-type littermate group are not shown; **P < 0.01, ***P < 0.001 compared with the vehicle-treated wild-type group. The current article details the pharmacological properties of a structurally novel inhibitor of LRRK2 kinase activity, MLi-2. This potent ATP-competitive active-site kinase inhibitor possesses excellent selectivity for LRRK2 over a broad range of kinases and a diverse panel of receptors and ion channels. In vivo, acute or subchronic dosing with MLi-2 in mice resulted in dose-dependent, central and peripheral target inhibition as measured by dephosphorylation of LRRK2 pSer935 LRRK2. To date the only phospho-antibodies that have been used successfully to monitor cellular LRRK2 kinase activity have been directed toward phosphorylation at Ser910 and Ser935 residues. Although not genuine autophosphorylation sites, pharmacological inhibition of LRRK2 kinase activity has been demonstrated to reduce the phosphorylation of Ser910 and Ser935 in an indirect, yet dose-dependent fashion (Dzamko et al., 2010). This indirect relationship raises the issue of the extent to which LRRK2 pSer935 LRRK2 dephosphorylation correlates with enzyme occupancy of a LRRK2 inhibitor. To try and address this, we developed a whole-cell binding assay with a novel LRRK2 radioligand [35S]MLi-A. Specific binding in Tet-inducible LRRK2-overexpressing SHSY5Y cells was demonstrated to be entirely LRRK2-specific and was displaced by MLi-2 and, indeed, by other LRRK2 inhibitors in dose-dependent fashion. Furthermore, IC50 values derived from competition binding correlated very well with IC50 values for pSer935 LRRK2 dephosphorylation in the same cell line. These observations led us to conclude that for this structural class of LRRK2 inhibitors, pSer935 LRRK2 dephosphorylation measures give a good approximation of enzyme occupancy in cells, and therefore supports its utility as a suitable in vivo pharmacodynamic proxy of target engagement. Although multiple potent LRRK2 kinase inhibitors, from structurally distinct chemotypes, have been reported in the literature, their utility to probe the tolerability and therapeutic potential of LRRK2 kinase inhibition in vivo has been hindered by a combination of poor selectivity, suboptimal pharmacokinetic qualities and/or a lack of brain penetration. Given the in vitro data demonstrating that MLi-2 is a highly potent and selective inhibitor of LRRK2 kinase activity, coupled with the pharmacokinetic data demonstrating good oral bioavailability and mean residence time, we sought to determine if MLi-2 was suitable for exploring LRRK2 biology in vivo. Acute and subchronic dosing with MLi-2 in mice resulted in dose-dependent reductions in both peripheral and brain LRRK2 kinase activity as measured by the dephosphorylation of LRRK2 pSer935 LRRK2 with IC50 vales of 0.8 nM and 1.1 nM using unbound brain and plasma exposure respectively. The lack of potency shift between unbound brain versus plasma underscores the lack of Pgp sensitivity and high brain penetration of MLi-2.Treatment with MLi-2 was found to be well tolerated, and no adverse effects of MLi-2 on body weight, food intake, or behavioral activity were observed at brain and plasma exposures >100× the in vivo IC50 for CNS LRRK2 kinase inhibition. The excellent tolerability of MLi-2 after subchronic dosing is particularly encouraging as a recent publication by Fuji et al., (2015) raised significant concerns over the tolerability of repeated administration of LRRK2 kinase inhibitors. That LRRK2 inhibition by MLi-2 is well-tolerated by rodents agrees well with a recent report demonstrating good tolerability with another LRRK2 kinase inhibitor (PFE-06447475) after chronic administration (Daher et al., 2015). Both MLi-2 and PFE-06447475 have higher potency and selectivity for LRRK2 (Henderson et al., 2015) compared with GNE-0877 and GNE-7915 (Fuji et al., 2015), thus it seems probable that adverse effects observed with GNE-0877 and GNE-7915 are not LRRK2-mediated and are most probably the result of an as yet to be determined off target activity. 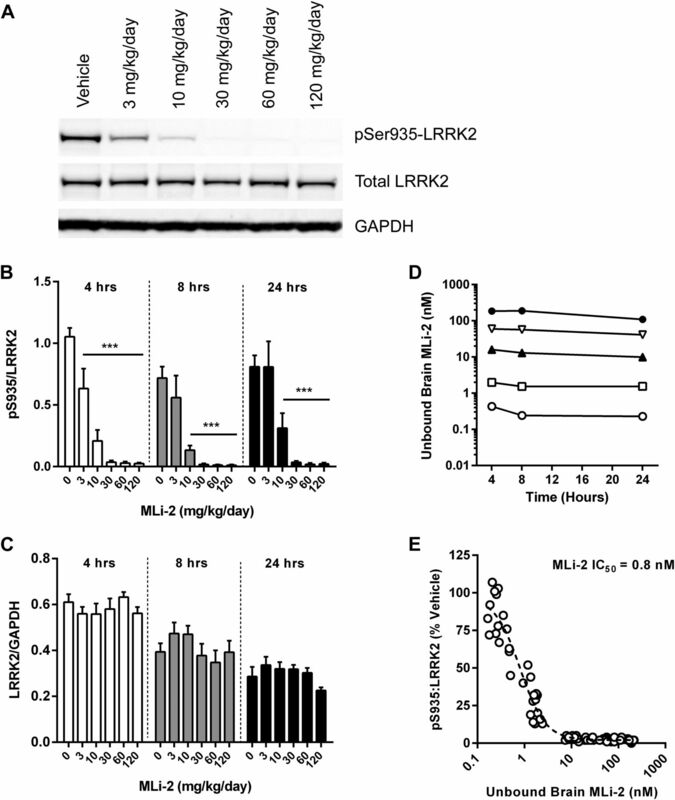 The ability to potently inhibit in vivo LRRK2 kinase activity, coupled with its excellent tolerability profile, underscores the utility of MLi-2 for confirming presumed LRRK2 kinase activity–mediated phenotypes. Consistent with observations made in LRRK2 KO rodents and nonhuman primates treated with less selective LRRK2 kinase inhibitors (Fuji et al., 2015), enlargement of type II pneumocytes (defined as very slight) was found in the lungs of all mice that received MLi-2 for 15 weeks. In addition to Ser935 dephosphorylation, we observed a significant reduction in total LRRK2 protein levels in the lung, although total LRRK2 levels were not completely ablated. To the best of our knowledge these are the first data showing that pharmacological inhibition of LRRK2 kinase activity in rodents can recapitulate the lung phenotype observed in LRRK2 KO animals. Previous reports have failed to observe the induction of the lung phenotype or the reduction in LRRK2 protein levels in mice and rats treated with LRRK2 for up to 28 days (Henderson et al., 2015; Daher et al., 2015; Fuji et al., 2015). However, the induction of lung phenotypes in rodents may require sustained LRRK2 inhibition and/or, longer treatment durations than previously achieved. In-diet dosing paradigms similar to that employed in the present study may be critical to precipitating this phenotype in rodents to support a detailed characterization of type II pneumocyte biology. In addition to exploring the role of LRRK2 kinase activity in lung, we also evaluated the disease-modifying potential of MLi-2 in the MitoPark mouse model of PD (Ekstrand et al., 2007). MitoPark mice display a gradual loss of DA neurons and progressive motor impairment resulting from DAT-Cre-dependent knockout of the mitochondrial T-FAM transcription factor MitoPark mice more closely approximates that seen in Parkinson’s disease than pharmacological or neurotoxin induced models of PD. In addition to its regional localization to the substantia nigra and reported subcellular compartmentalization to mitochondria (Biskup et al., 2006), LRRK2 is thought to modulate vulnerability to inhibition of mitochondrial respiration function (Saha et al., 2009). Furthermore, pathogenic LRRK2 G2019S has been associated with impaired mitochondrial structure, function, and mtDNA damage (Mortiboys et al., 2010; Cooper et al., 2012; Sanders et al., 2014), suggesting that LRRK2 kinase inhibition may confer neuroprotective effects in PD models of mitochondrial dysfunction, such as the MitoPark mouse. However, despite demonstrating sustained inhibition of LRRK2 kinase activity in the brain over the 15-week treatment period, MLi-2 did not stop or slow the progression of the behavioral and neurochemical phenotype observed in the MitoPark mouse model. That MLi-2 did not ameliorate the progression of the MitoPark phenotype may be viewed more as a reflection of the inability to faithfully model PD disease progression preclinically rather than a failure of the LRRK2 hypothesis, in the absence of data confirming neuroprotective effects of LRRK2 deletion in this model. In summary, the current work describes a structurally novel, potent, and highly-selective LRRK2 inhibitor discovered from internal medicinal chemistry efforts with our indazole series of LRRK2 inhibitors. Here, we detailed the pharmacological and pharmacokinetic properties of MLi-2 in mice, which demonstrate its suitability for exploring LRRK2 kinase biology in cellular and animal models. Through the use of the in-diet dosing approach, clear guidelines were defined to achieve chronic LRRK2 inhibition, along with extensive reference pharmacodynamic data, which will enable future lung de-risking studies and further evaluation in LRRK2 neuroprotection paradigms. As progress on these fronts has been hampered by the various limitations of currently available pharmacological tools, we hope access to MLi-2 will help advance preclinical efforts at understanding LRRK2 biology and, through collaborative efforts, shed light on novel pathways downstream of LRRK2 that may enrich the target space for PD therapeutics. Participated in research design: Cheewatrakoolpong, Fell, Hyde, Kennedy, Markgraf, Mei, Mirescu, Morrow, Lin, Smith, Parker, Yin, Zhou. Contributed new reagents or analytic tools: Basu, DeMong, Miller, Scott. Performed data analysis: Cheewatrakoolpong, Fell, Mirescu, Mei, Lin, Poulet, Smith, Yin, Zhou. Wrote or contributed to the writing of the manuscript: Ellis, Fell, Kennedy, Markgraf, Mirescu, Morrow, Poulet. ↵1 M.J.F. and C.M. contributed equally to the writing of the manuscript. (2013) Loss of leucine-rich repeat kinase 2 (LRRK2) in rats leads to progressive abnormal phenotypes in peripheral organs. PLoS One 8:e80705. (2007) LRRK2 low-penetrance mutations (Gly2019Ser) and risk alleles (Gly2385Arg)-linking familial and sporadic Parkinson’s disease. Neurochem Res 32:1700–1708. (2012) Brain Penetrant LRRK2 Inhibitor. ACS Med Chem Lett 3:658–662. (2010) The role of leucine-rich repeat kinase 2 (LRRK2) in Parkinson’s disease. Nat Rev Neurosci 11:791–797. (2012) Pharmacological rescue of mitochondrial deficits in iPSC-derived neural cells from patients with familial Parkinson’s disease. Sci Transl Med 4:141ra90. Daher JP, Abdelmotilib HA, Hu X, Volpicelli-Daley LA, Moehle MS, Fraser KB, Needle E, Chen Y, Steyn SJ, Galatsis P, Hirst WD and West AB (2015) LRRK2 Pharmacological Inhibition Abates alpha-Synuclein Induced Neurodegeneration. J Biol Chem. (2011) Characterization of a selective inhibitor of the Parkinson’s disease kinase LRRK2. Nat Chem Biol 7:203–205. (2010) Inhibition of LRRK2 kinase activity leads to dephosphorylation of Ser(910)/Ser(935), disruption of 14-3-3 binding and altered cytoplasmic localization. Biochem J 430:405–413. (2007) Progressive parkinsonism in mice with respiratory-chain-deficient dopamine neurons. Proc Natl Acad Sci USA 104:1325–1330. (2012) Discovery of highly potent, selective, and brain-penetrable leucine-rich repeat kinase 2 (LRRK2) small molecule inhibitors. J Med Chem 55:9416–9433. (2015) Effect of selective LRRK2 kinase inhibition on nonhuman primate lung. Sci Transl Med 7:273ra15. (2008) Phenotype, genotype, and worldwide genetic penetrance of LRRK2-associated Parkinson’s disease: a case-control study. Lancet Neurol 7:583–590. (2015) Discovery and preclinical profiling of 3-[4-(morpholin-4-yl)-7H-pyrrolo[2,3-d]pyrimidin-5-yl]benzonitrile (PF-06447475), a highly potent, selective, brain penetrant, and in vivo active LRRK2 kinase inhibitor. J Med Chem 58:419–432. (2011) LRRK2 protein levels are determined by kinase function and are crucial for kidney and lung homeostasis in mice. Hum Mol Genet 20:4209–4223. (2005) Identification of a novel LRRK2 mutation linked to autosomal dominant parkinsonism: evidence of a common founder across European populations. Am J Hum Genet 76:672–680. (2010) Inhibitors of leucine-rich repeat kinase-2 protect against models of Parkinson’s disease. Nat Med 16:998–1000. (2010) Mitochondrial impairment in patients with Parkinson disease with the G2019S mutation in LRRK2. Neurology 75:2017–2020. (2011) LRRK2 mutant iPSC-derived DA neurons demonstrate increased susceptibility to oxidative stress. Cell Stem Cell 8:267–280. (2004) Cloning of the gene containing mutations that cause PARK8-linked Parkinson’s disease. Neuron 44:595–600. (2011) Chemoproteomics-based design of potent LRRK2-selective lead compounds that attenuate Parkinson’s disease-related toxicity in human neurons. ACS Chem Biol 6:1021–1028. (2013) Genetic correction of a LRRK2 mutation in human iPSCs links parkinsonian neurodegeneration to ERK-dependent changes in gene expression. Cell Stem Cell 12:354–367. (2012) GSK2578215A; a potent and highly selective 2-arylmethyloxy-5-substitutent-N-arylbenzamide LRRK2 kinase inhibitor. Bioorg Med Chem Lett 22:5625–5629. (2014) LRRK2 mutations cause mitochondrial DNA damage in iPSC-derived neural cells from Parkinson’s disease patients: reversal by gene correction. Neurobiol Dis 62:381–386. (2012) Ser1292 autophosphorylation is an indicator of LRRK2 kinase activity and contributes to the cellular effects of PD mutations. Sci Transl Med 4:164ra161. (2012) Loss of leucine-rich repeat kinase 2 causes age-dependent bi-phasic alterations of the autophagy pathway. Mol Neurodegener 7:2. (2005) Parkinson’s disease-associated mutations in leucine-rich repeat kinase 2 augment kinase activity. Proc Natl Acad Sci USA 102:16842–16847. (2015) Progressive dopaminergic alterations and mitochondrial abnormalities in LRRK2 G2019S knock-in mice. Neurobiol Dis 78:172–195. (2012) Characterization of TAE684 as a potent LRRK2 kinase inhibitor. Bioorg Med Chem Lett 22:1864–1869.